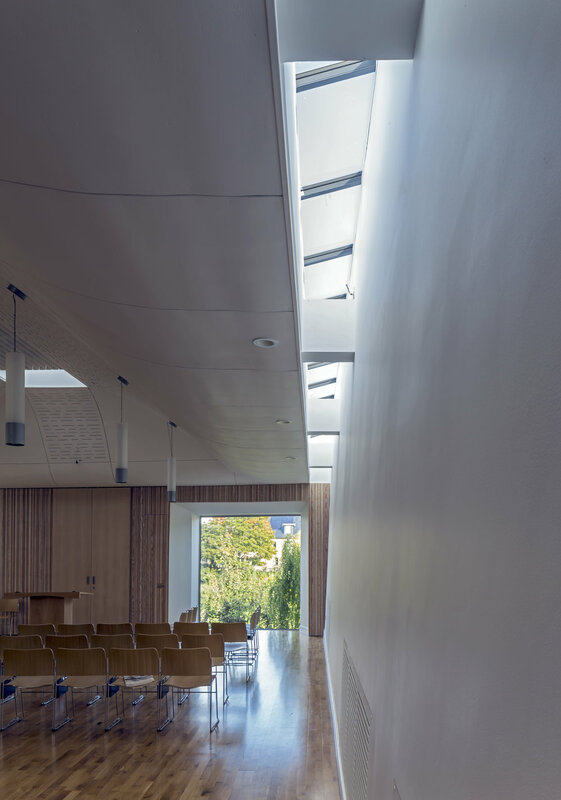 The Jewish community in Cambridge has searched for many years for facilities of its own, and this project delivers a new synagogue and community space in the centre of the city. The site is set between a three storey block of flats on one side and terraced housing on the other, with a part of Midsummer common on the back east side. The strong urban context, and the restricted availability of natural light down each side inform the design and particularly the section. Such concerns will be key to the successful resolution of the MJM project. A library and meeting room are placed at the front of the building off the main reception and stair. Community rooms are provided on the ground floor with admin and service facilities opening off the central hall. The elevation onto the main street is carefully composed of a series of layered elements, expressed with different materials and emphasis. The first floor library projects out as a red zinc bay, over the timber clad main entrance areas. To one side the verticality of the brickwork is increased, by using a stack bond arrangement. Towards Midsummer common the back stair is clad in timber, over the enclosing wall of the courtyard off the community rooms. The building is carefully scaled to the domestic architecture of the street, recognising the importance of providing a well-mannered addition to this historic area of the city. Again, this subtle and crafted approach will ensure that we make a suitably sensitive addition to the important, original Synagogue. Our design recognises the need for the central place of worship to be both practical and spiritual in its spatial form and use of light. The synagogue is therefore placed on the first floor towards the back of the building, with the space full height into the pitch of the roof. The simple but technically complex section, creates concealed perimeter roof lights down each of the long sides, washing the walls with natural light. An Oriel window on the east end facing Midsummer Common is set slightly to one side, with the Holy Ark forming the focus in the centre. Directly above, a glazed cupola casts light onto the Ark below. The seating layout for 200 people follows the slightly angled walls at each end, focussing the ceremony. The main space will be kept cool in summer by natural ventilation through the roof cowl, which is reversed in winter to circulate heated air through the continuous plenum.